To ensure many years of poolside relaxation and enjoyment, proper pool maintenance all year round should be in place. While hiring a professional is always an option, doing it yourself can save you big bucks. During the winter months, you’ll probably not use your swimming pool very often so it is most likely protected by a pool cover to ensure its security and longevity. 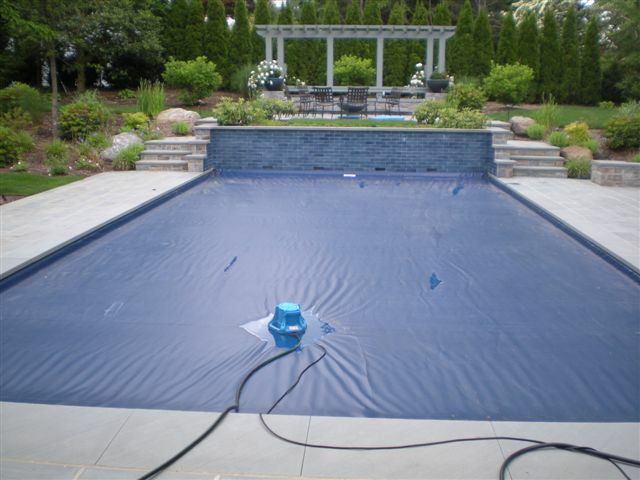 A swimming pool cover also keeps the level of pool water filled during off-season. Maintaining your pool filled is essential to preventing damage from groundwater pressure (if yours is an in-ground swimming pool), as well as structural damages (if it is an above ground pool). Check and secure your pool cover periodically. Snow, gust of wind, and heavy rain or storm can damage swimming pool covers. While a pool cover protects your swimming pool, you need to also make sure that your pool cover does not and will not get damaged, especially during the off-season. For above ground pools, make certain that the cover cable is tight enough, the air pillow is inflated and securely holding up the cover, and the cover clips are secure. 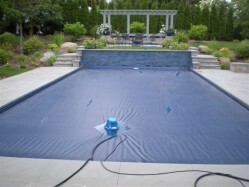 For in-ground pools, on the other hand, make sure that the pool cover is held in place by water bags or water blocks. If you have a safety cover for your pool, ensure that its components are fastening the pool cover to the deck or patio area. Clean and remove debris like leaves and small twigs from the top of the pool cover. Do so as careful as possible so as not to rip, tear, or damage your pool cover. A bundle of leaves, especially when wet, can weigh down your pool cover so make sure you remove them. If you own a leaf net, you could use this on top of the pool cover so its removal would be much easier. It would also be helpful to minimize the debris by eliminating the sources of it. Regularly sweep your patio, keep your yard free from fallen branches and leaves, and frequently trim hedges and bushes. Keep your pool cover dry with a pool cover pump. With a pool pump cover, or a pool saver kit, drain the water from the top of your pool cover. Standing water attracts birds because they most often use it as water supply and as birdbath. You want to prevent them from going near your pool cover as they can pierce it with their beaks. Water on the cover also creates an ideal breeding ground for mosquitoes and harmful bacteria, which could be potential health threats. A pool cover pump can help prevent all those damages. Typically, a pool cover pump can be either manual or automatic. An automatic pool pump cover requires an electrical outlet to function, while a manual pool cover pump does not. But either choices of a pool cover pump will work just fine. Contact Arizona Accurate if you need more info about pool pumps. What is a Solar Water Heating System? Contact us to learn more about our work, services and how you can help. Talk to one of our employees to hear why we love what we do. Copyright © 2018 Arizona Accurate. All Rights Reserved.